In the weeks leading up to this installment of Underappreciated Games, each title that I’ve featured has been somehow unfairly shunned, ignored, or forgotten by a specific group of gamers, cruelly doomed to obscurity. With Toy Commander, the Goozex community was to blame. With Mazin Saga: Mutant Fighter, the regular customers at my local video store were the subjects of my ire. This week, I turn my eye-daggers inward, as I examine a game whose greatness I spent years ignoring, despite repeated opportunities to pick up and play the damn thing. I don’t have a very good excuse for having never tried it out, really. I tend to assume the worst with so many licensed titles, and it seems like the amount that I adore a franchise is usually inversely proportional to quality of the game it inspired. And as a kid, I adored the Gargoyles cartoon. The ultimate impetus that convinced me to finally grab a copy of this Genesis lovely was fellow Sega Addict Matthew Jay’s eloquent and masterfully written praise of the game in his feature, “Ten Things That Aren’t Sonic: Disney Games”. Jay touted the relentless badassery of Gargoyles’s opening moments, from smashed stone floors, to mutilating countless Vikings, to jumping 20 feet in the air. He ended the bit with a statement that could not have been more accurate, “God of War ain’t got NOTHING on this game.” Immediately after my brain processed that sentence, I opened a new tab and went straight to eBay. Whenever I pop in a game for the first time, my irritatingly jaded mind loves to go fishing for snarky comments. 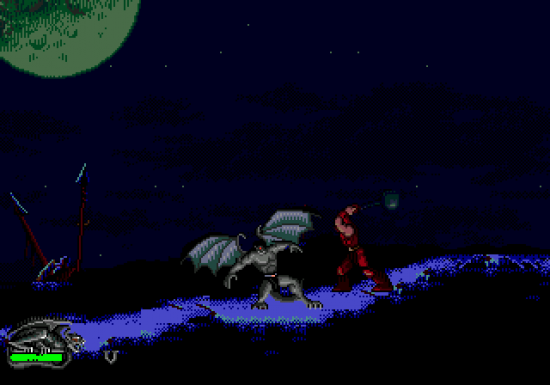 Of course, Gargoyles was no different. 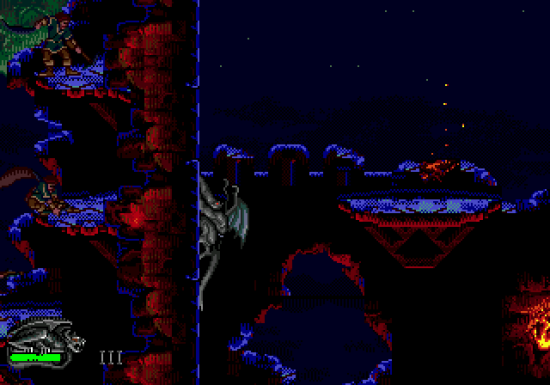 After playing for a few minutes, I couldn’t shake one specific thought – Shouldn’t this be called Gargoyle? Or Gargoyles Origins: Goliath or something LOLCOPTER!!! You see, Goliath is the only character you can play as in a game based on a series that’s known for its several unique creatures, each with their own quirks and original design. After putting up a review for X-Men, a title whose greatest strength is the ability to switch between different characters on the fly, it just feels like a major opportunity was missed here, especially when the quality of the gameplay is so consistent. Sorry guys. We'll call you when we need you. If one I were to use one word to describe the feel of the gameplay, it would probably be “flowing”. Once you’ve gotten Goliath’s controls down, it becomes remarkably easy to get into a rhythm of smashing through walls, swinging claws and picking up enemies, bursting through floors, and wall-climbing to traverse the game’s gorgeous and beautifully designed stages. As with Aladdin, Lion King, and several other Genesis Disney games, the character animations are flawless and smooth, adding to the feeling of empowerment that Goliath’s already impressive and accessible moveset provides. The only real drawback is probably the complete lack of some kind of flying or gliding mechanic, something you’d think would be essential to a game about monsters with batwings. Maybe some levels in between that would utilize only your gliding abilities (a la Rocket Knight Adventures) may have filled this void. The double-jump mechanic works as a pretty suitable replacement, especially when the certain accentuate this with bursts of air that end you even higher, but nothing could match the feeling of gliding from rooftop to rooftop. When all of these moves are combined seamlessly, the resulting feeling is that of genuine exhilaration, an impressive accomplishment for a 15-year-old Genesis game. Adding to this feeling of exhilaration is the game’s complex and varied level design. As I mentioned before, environments are pretty and intricately detailed, all the while perfectly representing the mood and feel of the cartoon (though this does occasionally work to hinder the visual style a bit, washing levels with a consistently dark and gloomy hue). The stage construction is rarely repetitive, often challenging, and almost always fun. With each new level, new features are introduced, from crashing through walls and jumping in catapaults in the Viking stage, to slamming through multiple apartment building floors in the New York City stage, to clinging to vats of molten metal and dodging exploding boiler doors in the factory stage. This makes the game consistently interesting and entertaining, even when the couple moments that do repeat themselves threaten to mar the experience. The most jaw-clenchingly aggravating of these repetitive moments has you swinging from pole to pole, ascending a building, castle, or rock wall as some form of enemy (fireball, flying robot, etc. etc.) tries to shoot you, interrupting and canceling your jumping animation. If you miss one pole, you fall straight down to the bottom, where you have no choice but to start again. This sequence seems to occur least once with every environment change, and it manages to crank the already challenging difficulty up to unfair levels in the later portions of the game. By the time you finish some of those wall-climbing segments, you will wish with every ounce of your being that the inventor of that mode of platforming will someday get shot in front of his family. Yeah, it’s that frustrating. 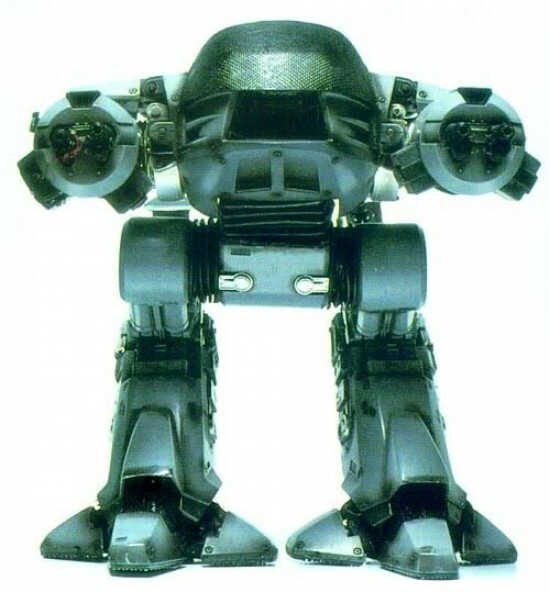 Some of the later enemies add to this frustration, especially one ED-209-looking robot that absorbs so many hits before he dies that you might mistake him for a mini-boss. The later half of the game is filled with these guys, heaping on the difficulty as if you didn’t already have a full plate. Awesome - Robocop reference in a Gargoyles feature. I can die now. Unfortunately, bosses of the game did not share this same level of challenge. What’s worse, they are also incredibly uninspired and repetitive, and usually required the same exact tactics to be defeated. Just about every boss battle, save for maybe the elevator shaft boss, can be beaten using the following strategy: Slash, slash, slash, slash, slash, slash, jump, jump, slash, slash, slash, slash, slash, jump, slash, slash, slash. Ok it’s dead. In the end, not one of these bosses is memorable or satisfying, which is a shame, considering the empowering feeling that the rest of the game creates. Coming out of this experience, I want to slap myself for neglecting one of the most underappreciated Disney Genesis games of the 16-bit generation. The gameplay is consistently fast, deep, and incredibly fun. Few games from that time period will do such a good job of making you feel like a badass. The level design is massive, multi-layered, and extremely pretty. 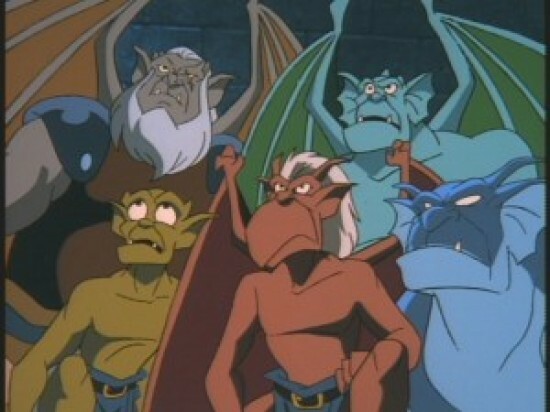 Like Matthew Jay said in his article, if you’re Metal, you think Gargoyles was the most badass cartoon of your childhood. I hope he’ll oblige me when ask if I can add to that: if you’re breathing, you’ll probably love Gargoyles for the Genesis. Is it bad that the first thing I did when I saw the headline was skim through the post to see if my column was mentioned? Haha, I’m glad you did. I was a little nervous about quoting so much of it, but it really was what inspired me to finally buy a copy. I had to give you your props.